16-inch casemated gun, similar to those at Fort Dearborn. 6-inch gun at Fort Columbia State Park, Washington state, similar to Battery 204. Odiorne Point State Park is a New Hampshire state park located on the seacoast in Rye near Portsmouth. The point got its name from the Odiorne family, who settled on the land in the mid-1660s. Among the park's features are the Seacoast Science Center and the remains of the World War II Fort Dearborn. The park is the site of the former Pannaway Plantation, the location of the first European settlement in New Hampshire, and is commemorated by a memorial in the park. The Seacoast Science Center is the primary facility in Odiorne Point State Park. It offers exhibits including aquariums and mockup whale skeletons, along with a variety of indoor and outdoor programs on marine life. Programs are offered for school groups, families, adults, children, and other groups. Environmental day camps up to 8th grade are available. The Science Center includes a marine mammal rescue center. In summer, weddings and special events at an outdoor tent can be booked. Not to be confused with the Fort Dearborn in Chicago. Prior to 1942, the site of the park was private, expensive oceanfront land. In 1942, during World War II, the site was condemned and purchased by the United States government for the construction of Fort Dearborn as part of an across-the-board modernization of US coast defenses. In 1961 the site was ceded to the state of New Hampshire; the previous owners were not given the opportunity to re-purchase the land. The fort was named for Henry Dearborn, a major-general in the Revolutionary War and later Commanding General of the United States Army and Secretary of War. The fort was part of the Harbor Defenses of Portsmouth, New Hampshire, along with Fort Stark, Fort Constitution, and Fort Foster. In 1940-1944 the Harbor Defenses of Portsmouth were garrisoned by the 22nd Coast Artillery Regiment. The first battery at Fort Dearborn was called Battery Dearborn, and consisted of four 155 mm towed guns on "Panama mounts", which were circular concrete platforms. The platforms remain today. Fort Dearborn was primarily acquired to build a battery of two 16-inch (406 mm) Mark IIMI ex-Navy guns, heavily protected by concrete and earth casemates. This was completed and test-fired in June 1944, and eventually superseded all other heavy guns in the Harbor Defenses of Portsmouth. It was initially called Battery 103 and later named Battery Seaman in honor of Colonel Claudius M. Seaman. The battery remains today. A Plotting, Switchboard, and Radio (PSR) bunker housing a plotting room as part of the Coast Artillery fire control system is to the west of Battery 103. 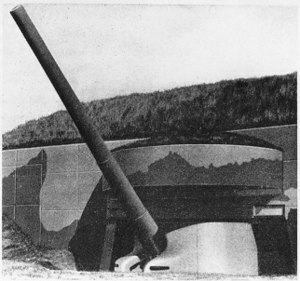 A companion battery, Battery 204, consisted of two 6-inch (152 mm) M1 guns in shielded barbette mounts with a large bunker between them containing magazines and fire control facilities. This was also completed and test-fired in June 1944. The battery is near the Seacoast Science Center, and today has several 16-inch shells displayed. A similar 6-inch battery (Battery 205) was built at Fort Foster but not armed. Near Fort Dearborn at Pulpit Rock, short-range defense was provided by Anti-Motor Torpedo Boat Battery (AMTB) 951, consisting of four 90 mm guns, two on fixed mounts and two on towed mounts. A similar 90 mm battery, AMTB 952, was built at Fort Foster, and AMTB 953 was planned for Fort Stark but never built. In 1948 Fort Dearborn was deactivated and all guns were scrapped. The Pulpit Rock Base-End Station (N. 142), just outside of the park's southern boundary, is on the National Register of Historic Places, no. 10000188. Part of Fort Dearborn was used as a radar station by the United States Air Force beginning in 1949, and in 1955 this became the Rye Air Force Station. This was an Air Defense Command radar site that also supported the nearby Pease Air Force Base of the Strategic Air Command. In 1957-59 Rye AFS was deactivated, but an unmanned "gap filler" radar remained active until 1968. Nothing remains of the Air Force installations. EDALHAB, an underwater habitat used for saturation diving experiments in Lake Winnipesaukee in the late 1960s, at the Seacoast Science Center. Battery 204, a former 6-inch gun battery, is in the background. ^ "Odiorne Point State Park". Geographic Names Information System. United States Geological Survey. May 8, 2001. Retrieved October 12, 2012. ^ Noyes, Libby & Davis (1928-39). Genealogical Dictionary of Maine & New Hampshire. Portland, ME: Genealogical Publishing Co.
^ Charles W. Brewster. "Old Pannaway:First NH Settlement". SeacoastNH.com. Retrieved 2008-08-01. Wikimedia Commons has media related to Odiorne Point State Park. This page was last edited on 24 March 2019, at 11:02 (UTC).